1. Move an oven rack to the top (or second top) position and set the broiler on high. Line a baking sheet with foil or use an oven-safe dish. 2. With a back of a spoon, stir the sugar and spices until there are little to no lumps, then sprinkle evenly onto each grapefruit half. 3. 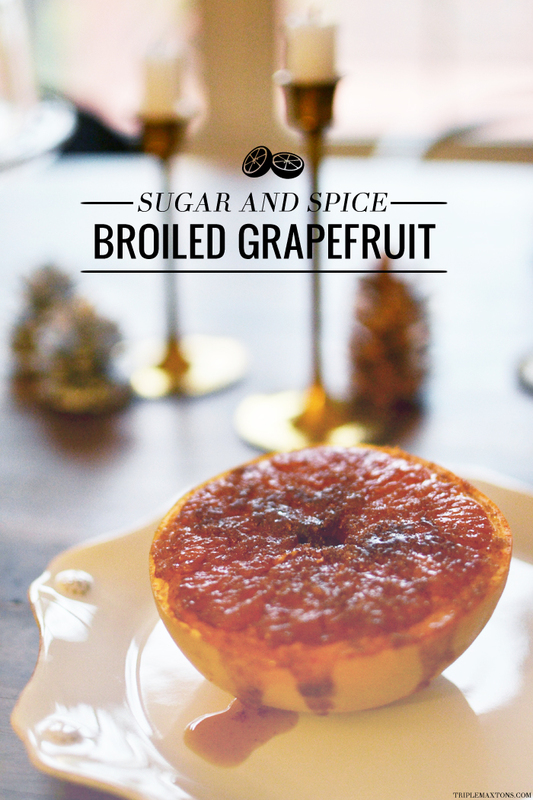 Broil for 3 to 6 minutes or until the grapefruit begins to puff and the sugar begins to bubble and caramelize. This is one of my favorite things to do for breakfast! Hm, intriguing! I'll have to try this at breakfast with my sister-in-law. Thanks for sharing. I'm glad to hear someone else ate and ate and ate and ate....I'm excited about this recipe. Stay tuned on how it turns out!!! !